With the Galway Races just over six weeks away it is never too early to start planning your Race Day outfit! I for one have had my annual leave booked for the last year to ensure I will not miss Galway’s supreme annual fashionista event. I have attended the Galway Races every year for as long as I can remember and it is always a great occasion to get dressed up and check out the fab style on display. Only last week I was looking through my wardrobe trying to decide what I would wear to Ladies Day! Now it looks like my fashion prayers have been answered! I received an invite to a Galway Races Glamour Themed Fashion Show in advance of the Summer Races Festival. I am sure this event will be an amazing success and it is all in support of two great charities – The Irish Cancer Society and Autism Assistance Dogs Ireland. The Fashion Show takes place in the Clayton Hotel, Tuesday June 25th. 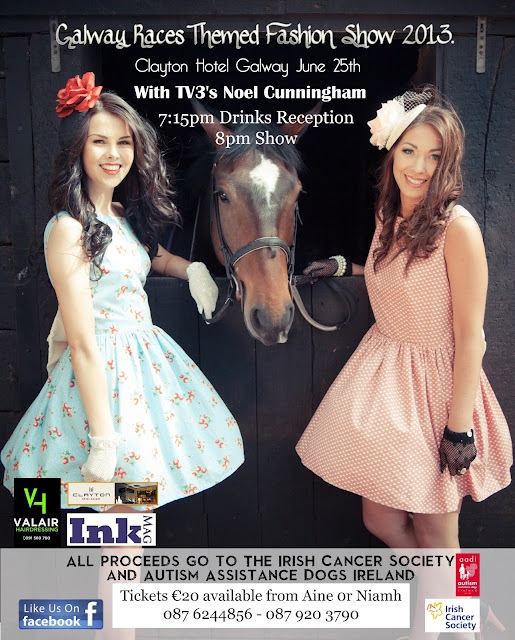 Many of the Wests best boutiques, designers and milliners will be showcased on the night and with Noel Cunningham from TV3 as host it promises to be a night filled with fun and fashion frolics! There will be exhibitors on the night and also some of Galway’s best make-up artists on hand to provide make-up tips ensuring you will be ultra glam for the big week! Fashionistas, please support this fantastic charity event and get your ticket for €20. The night kicks off at 7.15pm with a drinks reception and the show starts at 8pm. This is certainly a night not to be missed by any fashionista race-goers! There will be prizes on the night for best dressed and best hat! I hope to see some of my fashionista followers there in addition to my sister Stephanie who will be modelling on the catwalk! Contact me at becboopfashionistaworld@gmail.com or message me on facebook to purchase tickets! Yes the details are above :)contact me at becboopfashionistaworld@gmail.com or message me on facebook to purchase tickets!